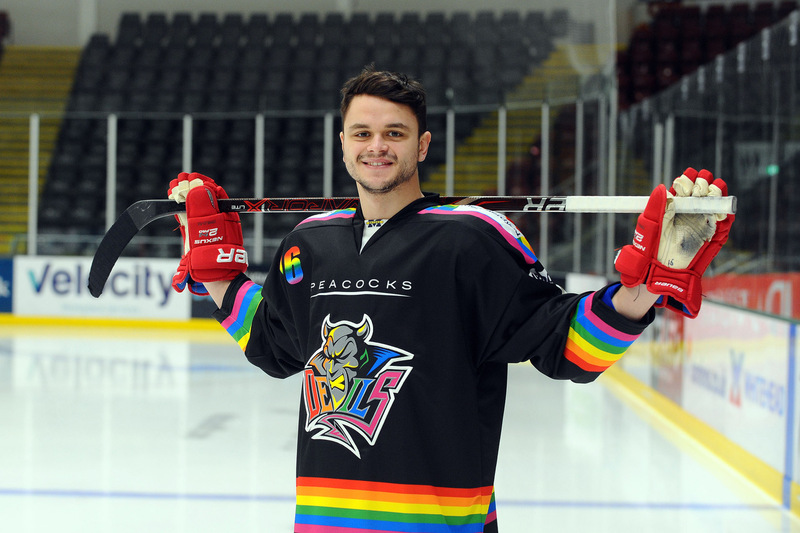 Cardiff Devils forward Sam Duggan in the new jersey for Pride night. Cardiff Devils are playing for points and pride when they take on Coventry Blaze at the Viola Arena in Cardiff Bay this evening (Saturday, 7pm). It’s Pride Night at the Viola and Devils will wear special jerseys to promote hockey for everybody. “Games against Coventry are always special,” says head coach Andrew Lord. “The rivalry goes deep and it really shows. They are always feisty encounters and often extremely entertaining matches. Tickets are virtually sold out at the 3,000-plus capacity arena with only 25 left this morning. Devils and Blaze both badly need a win this evening. Elite League leaders Devils are one point ahead of closest challengers Belfast Giants, who won 3-2 against Guildford Flames in overtime last night. Coventry, meanwhile, are embroiled in the race for a play-off place and are only a point short. Giants kept their unbeaten streak going with a 3-2 home win against Flames, but were made to work hard for the two points by visitors who almost held on for a win of their own. Despite 30 shots on goal in the opening two periods, neither side was able to break the deadlock. The first goal came at 44-30 through Flames’ John Dunbar, although just over four minutes later Blair Riley converted on the powerplay to make it 1-1. With 5-41 to go the Flames led again with Welsh forward Ben Davies scoring. Colin Shields netted Belfast’s second 2-10 to force the game into overtime and then Chris Higgins fired the winner (61-28). Giants and Flames meet again in Belfast this evening and Giants coach Adam Keefe said: “It’s never been easy against Guildford this season. Cardiff Devils Mike Hedden in action against Coventry Blaze. Pic: Richard Murray. Guildford’s Paul Dixon says: “The teams match up well and matches between us have all been close this season. If my guys play the same way it’s all I can ask. Welsh Runners Spread Their Wings . . . And Chase PBs.